Navratri Events & Celebrations in Mumbai | Dandiya Parties and more! For all of you that can’t wait to bring out your ghagras and dhotis, worry no more as Navratri is almost here! Here's a pick of top events on Insider. It's that time of the year: Life is a little more colourful, there are festivities all around and (oh yes) there are sweets. Many sweets! There are several Navratri parties happening in Mumbai, and more will be added here closer to the dates - so keep a lookout! 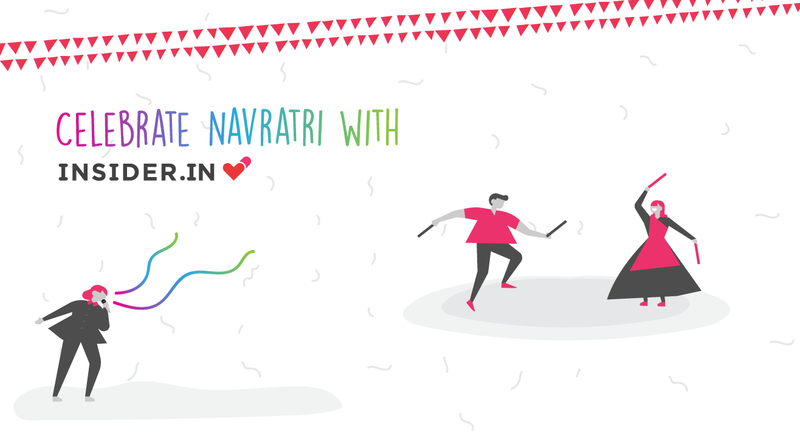 Buy any Navratri or Dandiya event on the app and get Rs 50 cashback. (T&C apply). Download the Insider.in app on Android and iOS. No coupon code needed. Catchy dandiya beats & parties (including indoor ones, why should the fun stop at 10 PM?). Stupendous mandals, Gujrati cuisine, performances by renowned artists, singers and DJs: From dance to garbo to Bollywood to sufi, it's all here. Indoor parties where the fun doesn't stop, and outdoor parties to revel in the post-monsoon weather! Navratri can be termed as a pre-Diwali since the country is lit up during both these festivals. Long stretches of colorful lights, bright lamps and lively decorations can be seen on every nook and corner of India during those nine nights (and ten days). While the streets and mandals look prettier than usual, so do the people who celebrate Navratri! While many women follow a nine-day colour coded dressing pattern in the day and fabulous ghagras or cholis in the night, the men bring out their shiny kurtas and dhotis to join in. What’s more? Even the dandiya sticks we dance with are bedazzled and have sparkly sequences all over them! Thumping music and a lot of dancing! One cannot celebrate Navratri without the music and dance that goes along with it. While we’re all fans of weekend-long music festivals, how great is it to have a dance party that lasts more than a week! A real test of stamina, dandiya nights not only include all-time favorite Navratri hits but now also feature live performances by well-known artists and DJs. Diets can wait (there's a new year resolution for that) - a food coma's coming your way. Sugar, spice, everything nice: It's all here as Navratri promises a nine-day feast with something new every night. After all, that dandiya madness needs fuel.